If you haven't had your soil tested recently (or ever), now is a good time to do it. Soil should be tested every 3-4 years. 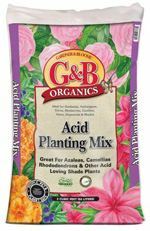 Soil that is too acid, too alkaline, or lacking in nutrients will not produce healthy plants! 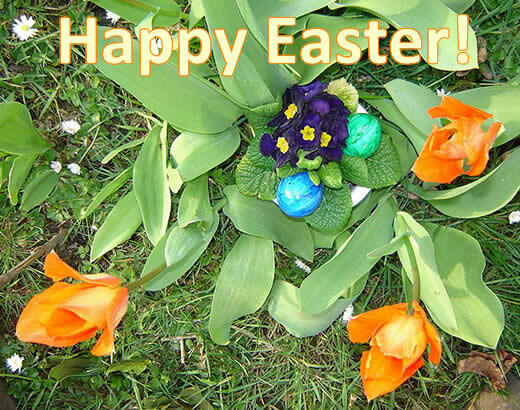 We will be open special hours for Easter Sunday: 9:00 AM to noon. When designing a garden, focal points are an important concept. A focal point is a feature that draws the eye. This can be anything from a tall tree to a colorful grouping of plants, to a strategically placed statue. Having a focal point (or several) in your landscape or garden gives the whole area a more orderly look. You can create an eye-catcher by something as simple as planting a tall, colorful plant in the midst of smaller plants in a flower bed. If you already have a naturally imposing feature, such as a large tree, consider placing colorful perennials around it. Another way to draw the eye is to use bold contrasts. A grouping of bright red or white flowers in the midst of an expanse of green lawn will draw attention. Even a bright color amidst pastels will work. 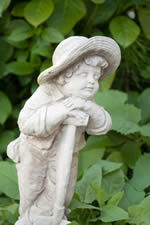 One of the most popular methods is to use statues and other garden decor, such as fountains, birdbaths or bird feeders. Used as a centerpiece of a design, these are a great way to create a focal point. A driveway or path with brightly colored borders is another popular way to draw attention. Both solid colors and mixed colors can work well here. If you are lucky enough to have a naturally good view, use it as a backdrop for a grouping. If you have the sort of yard that lends itself to paths, consider a flower-covered arch trellis as an entryway. Come in and look around; you'll find plenty of good ideas! William Cowper once wrote the now famous words, "Variety is the spice of life." This couldn't be truer in the garden. Nothing spices up a garden like plants with variegated foliage. Use too many and they'll make you dizzy. But placed in the background or strategically planted in the midst of the garden, variegated foliage can bring out the best in all of your plants. Variegated plants come in a myriad of shapes and shades. From bold to subtle, there's something for every gardener's personal tastes. If it's a tree you're looking for, nothing steals the show like the 'Flamingo' box elder. It can be the centerpiece to build your entire garden around. Many variegated plants make excellent hedges. 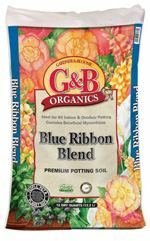 Instead of hiding in the background, they provide a great starting point to planning a garden. Consider variegated English boxwood, 'Red Twig' dogwood, 'Gilt Edge' silverberry, euonymus, variegated English holly, variegated kohuhu, variegated mock orange, dappled willow or weigela. Many of these plants also look wonderful when planted individually to bring out a corner or become a focal point on a mound or garden island. If a hedge is not your cup of tea but you still want to hide some of your fence line, a variegated bower vine or variegated potato vine will do an excellent job. For bursts of color and interest throughout your garden, consider variegated varieties of abelias, daylilies, licorice plants, phlox, mock orange, sage, stonecrop, weigela, New Zealand flax and ornamental grasses. If your garden has shaded areas, don't worry. There are many great selections for areas with less sunlight. Many popular variegated plants prefer shade or partial shade. No matter what your garden setting is, variegated plants not only look great but also add interest. We have a large selection of plants with unique foliage and variegated colors. Stop by soon and see the beauty of these plants in person. You wont be able to resist them! An artichoke (Cynara scolymus or C. cardunculus) is a giant thistle which becomes a beautiful flower. Well, it could become a beautiful flower--if we didn't pick it as a flower bud and eat it as a vegetable. Artichokes, native to the Mediterranean region, were later introduced to Southern Europe and Asia. The artichoke has dramatic and sculptured gray green foliage that is very attractive in your vegetable garden. In fact, this vegetable is beautiful in your ornamental garden, too! An artichoke's overall form is almost like a fountain and needs up to 4 feet of space for full growth. It likes full sun, cooler temperatures and moist soil. If you live in a very hot zone, plant it in the shade. Mulch under the plant to help maintain the moisture that it loves. 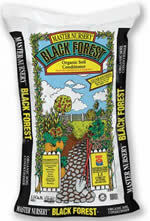 At planting time, plant dormant roots or young plants with the root shoots just above the soil level and then mulch. Water at least once a week, keeping the root system moist. Aphids, snails, slugs, and earwigs tend to be the artichoke "pest of the day." Blast the aphids and earwigs off with water. Use a snail bait for snails and slugs. The best time to harvest your artichokes is once the edible flower buds are 2-4 inches in diameter. Cut off the bud, including 1.5 inches of stem with the bud. At the end of the season, cut back the old bearing stems/foliage to near ground level and mulch around the remaining plant. Don't forget to give your artichokes a well-balanced fertilizer. Few of us can conceive of cooking (or eating) without the presence of tomatoes in our diet. In the US, the tomato is the summer vegetable (or fruit?) most often grown at home--and there are plenty of cultivars to grow. The U.S. Department of Agriculture claims there are 25,000 tomato varieties. But this delicious food didn't always have it so easy. Up until the 1800's, most people viewed the tomato with caution--and many with outright fear. 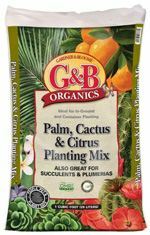 Originally grown by the Aztecs and Incas as early as 700 A.D., it is thought that the first seeds made their way across the Atlantic sometime in the 1500's. Early Europeans categorized it with a group of well-known poisonous plants of the era: henbane, mandrake and nightshade. Because of its association with nightshade (whose hallucinogenic effects include visions and the sense of flying), it quickly became associated with witchcraft. In German folklore, witches would use plants such as mandrake and nightshade to summon werewolves (in fact, the common German name for "tomato" translates to "wolf peach"); because of this, the tomato was widely avoided (by everyone other than practitioners of the "dark arts," that is). Legend has it that one of the main turning points in the popularity of the tomato in the US is largely due to one Colonel Robert Gibbon Johnson. On September 26, 1830, standing on the courthouse steps in Salem, Massachusetts before a crowd of interested onlookers, he proclaimed his intention to eat a whole basket of the red fruit and survive. One member of the audience was his doctor, who loudly stated, "The foolish colonel will froth and foam at the mouth and double over with appendicitis. All that oxalic acid - one dose and he is dead! He might even be exposing himself to brain fever! Should he, by some unlikely chance, survive, his skin will stick to his stomach and cause cancer!" Colonel Johnson proceeded to eat the basket of tomatoes and survive with no ill effects. Even with all its detractors, the tomato had a few fans. Some people once believed that placing a ripe tomato on a mantel of a new dwelling would ward off evil spirits and guarantee future prosperity. Since ripe tomatoes tended to go bad quickly, it became popular to make stuffed fabric tomatoes to put on the mantel. Invariably, people sewing began to use them as handy pin holders. To this day, pincushions are very commonly covered with red fabric--and many still look like tomatoes. Today, are much more likely to put a ripe tomato on our plates than on our mantels. We can enjoy all the different shapes, colors and flavors of tomatoes available. Here's wishing you a bumper crop this summer! What’s the best way to over-seed a lawn? That depends on whether it is the entire lawn or just a bare spot. The best time to over-seed is early spring and early fall. For bare spots, make sure to remove any old dead growth that still exists. 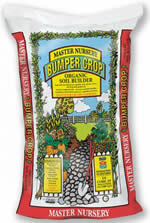 Then scratch the soil surface at least 1-2 inches deep and level off. Apply your seed and cover with 1/4 inch of top dressing. 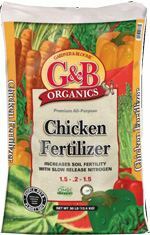 Make sure to keep the area moist at all times until the seed has germinated and rooted. You should be able to mow the spot (on a high level setting) three weeks after the seed germinates and is visible. Before over-seeding an entire lawn, mow your lawn to half its normal height. We recommend dethatching your lawn and removing all thatch debris before applying new seed. 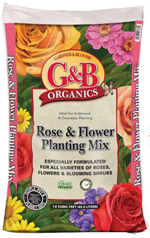 Then over-seed at the recommended over-seeding rate on the package of your lawn seed. 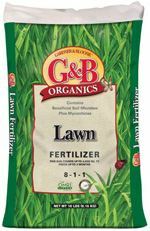 Cover the entire lawn with a 1/4 inch layer of the same top dressing mentioned above. Switch your watering cycle to at least twice daily (short cycles) the first two weeks, once per day the second week, every second day the third week and then back to your normal watering cycle from then on. Try not to mow for at least two weeks after applying seed. Then do so at a higher than normal level setting until the new grass is well established.